The crossover series that taps nicely into two major movie franchises either already released or in the works. Joshua Williamson has been the series scripter and brings the proceedings to a close in the final instalment of issue #6. The Justice League and Suicide Squad need to save the world from Eclipso, who is now inhabiting the body of Max Lord. In comic book mythology Eclipso is the living incarnation of the Wrath of God and the Angel of Vengeance who turned rogue. We discovered in previous issues that Eclipso is using the heart of darkness to manipulate Max Lord and the Justice League members. Things commence with a battle raging at the White House, Eclipso is converting members of the Justice League and Suicide Squad into the infected. Batman’s plan is to trap Superman’s heat vision using a prism constructed by Killer Frost, that converts the energy into sunlight to force Eclipso to exit Max Lord’s body. It could never be quite that simple and with Killer Frost virtually out of power the Caped Crusader insists that she drain his lifeforce to compensate. Frost needs to channel so much of her powers to overcome Eclipso that she almost makes the ultimate sacrifice in doing so. It’s some rapid character development for someone from the Suicide Squad who is usually comfortable on the other side of the fence. But, we needn’t fear pretty soon the whole of the Justice League and Suicide Squad of course are working together offering their own life forces to a beleaguered Emma Frost. Max Lord is now recaptured and held under the supervision of Amanda Waller. In a kicker, while Waller divulged that Lord is clearly unsuitable for Task Force X, he may be interested in joining a different secret organisation in Task Force XI. As a concluding episode, which can be tricky, issue #6 still manages to dish up trademark group battle sequences and squeezes in some individual character development. 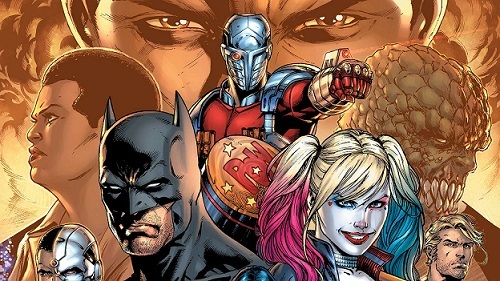 One of the purposes of Justice League and Suicide Squad is clearly to function as a lead in for the new Justice League of America titles. We know that Lobo and Killer Frost will be signing up for the new Justice League line-up. Howard Porter, Alex Sinclair and Rob Leigh produce some pleasing art work. Howard Porter is considered to be somewhat comic art royalty and returned to the profession after a lengthy absence due to a hand injury.